There are 5 posts filed in NUBSLI (this is page 2 of 3). 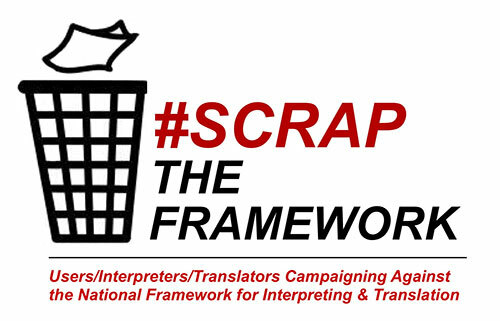 NUBSLI has launched its #ScrapTheFramework campaign and is asking organisations and individuals to sign an open letter to Francis Maude MP, Minister of the Cabinet Office asking for the new national framework for language services to be scrapped. The reasons are that the framework is not robust or fit for purpose, does not have appropriate minimum standards of qualifications, little monitoring is proposed and has many loopholes that will allow sub-standard levels of service. Why? People with no interpreting qualifications can be used in mental health, child protection, health, employment and in every area of public life. There are other reasons but do you really need more than that? This blog has reported throughout the disastrous MoJ framework which started in 2011. NUBSLI has seen nothing to suggest the government is trying to uphold standards and safeguard the Deaf community with this framework. We have seen what has happened with the MoJ contract. The national agreement was effectively ripped up, the national register was superfluous, legal personnel were wandering the streets and, in desperation, hounding workers in chinese takeaways trying to find anyone who could come to court to interpret or even used Google translate. The MoJ saga continues. Even after a scathing independent report by Matrix, the government still denies the scope of the problems. Minor improvements have been promised with this new framework. There is still a lack of consultation with organisations and the Deaf community are still largely unaware of what is about to happen. And the framework in its current state looks like it will roll back the Deaf community’s progress by about 30 years. Deadline Wednesday 25th February 5pm.